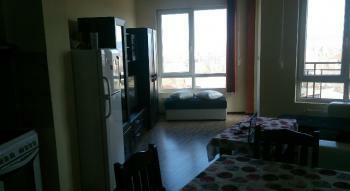 The following offer is for an apartment for sale, located in the city of Sofia, Mladost quarter. The apartment is only five minutes from the subway station, close to a kindergarten, school, and the post office. It has amazing panoramic views towards Vitosha Mountain. The apartment is ready to move in with furniture included in the price. The building has Act 16 since 2011. There is possibility to purchase an underground parking space with inside connection to the apartment. There is elevator, extremely well maintained common areas. Each floor has two apartments. The total living area is 96 sq m and the apartment consists of an entrance hall, two bedrooms, functional, bright and spacious living room with kitchen and balcony, a bathroom with WC and second WC (laundry room). All rooms have laminate covers and latex paint. The bathroom is finished with terracotta and faience. There is air conditioning.